A tie is one of man’s best friends, so acquiring the skill of how to tie a tie is absolutely crucial! Whether it’s for the office, a special occasion or a date night, knowing how to put on a tie is one of menswear most important lessons. Tying a tie isn’t actually that difficult - it just needs a bit of practice like any other skill. So without further ado, here’s a step by step description - including pictures! - of how to put on a tie. Though there are a lot of different tie knots out there, these top four knots are your go-to’s for a wedding, a day at the office or date night. The most loved necktie knot is the Double Windsor one - we’ll get to it in a bit. 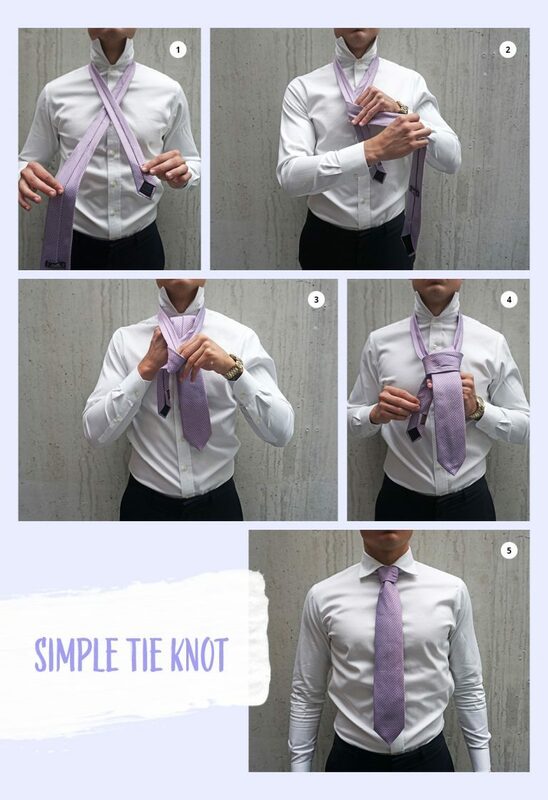 So, let’s get to it: how to tie a tie! The first on our how to tie a tie list, (and often called the american knot) this one is a great choice for shirts that have a wider collar. Start with the inside facing up, narrow end to the right (1). Then, hold the narrow end and pull the wide end through (2). When the wide ends comes out of the opening, let it come out on the right, inside facing up (3). Next, bring the wide end over to the left (4), pull it through the opening once again (5). Get the wide end through the loop (6) and you’ve just tied a Pratt Knot! Slightly thicker knot, this one’s a wonderful option for when you’ve got something important coming up. It’s got a bit more of a dressed up look to it and it’s a bit more of an easy way to tie a tie. Begin with the neat side up, wider end to the left. Cross the smaller end underneath the wider end (1). Loop the wider end by passing through the opening (2), take it down (3) and move it to the left (4). Bring the wide end through the opening again (5) and leave the broad side to the left (6). Turn the wide end over the small end (7), and bring the wider end through the opening (8). Finally, pull the wider end through the loop (9) and you’ve got yourself a Double Windsor knot! A misleading name this one’s got, as even though it’s called the simple one it’s surely isn’t! One could say this one’s got a three stars how to tie a tie difficult degree. Start with the inside facing up, wide end to the right, small end to the left. Take the ends and cross them, pay attention to the narrow end falling just above your belly button (1). Put the wide end over the narrow end, holding it at the top (2). Hold it while you are pulling the wide end through the opening, from the bottom up (3). Bring the wide end through the loop you’ve made in step 2 (4), and pull the wide end down till you’ve got yourself a Simple Knot (5)! 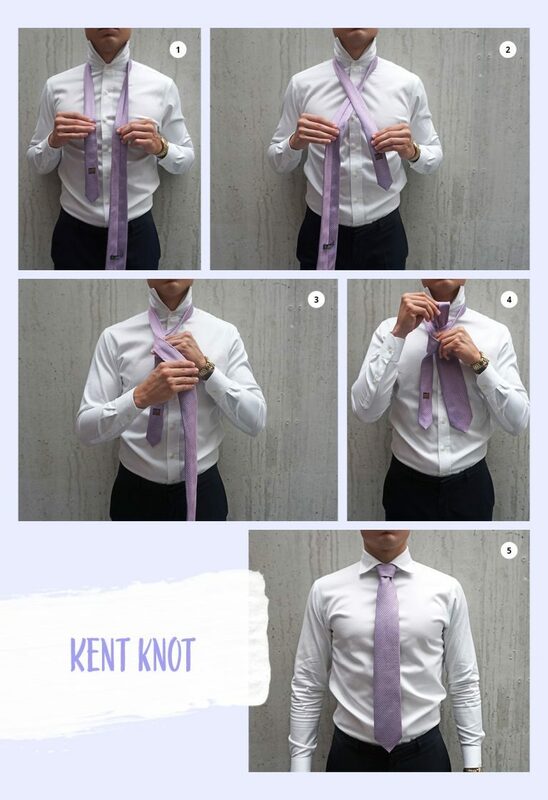 If you’re looking for a smaller knot that uses less of the tie so that you’ve got a normal length left after the knot, this one’s for you. With a more casual feeling, it’s perfect for an everyday outfit, and it’s also one of our favourites as it’s a super easy way to tie a tie. Start with the tie neat side up, narrow end to the right. Turn the inside upward (1). Cross narrow end over wide end (2), cross wider end over the narrow side, neat side on top (3). Bring the wide end through the loop (4) and you’ve tied a Kent Knot! 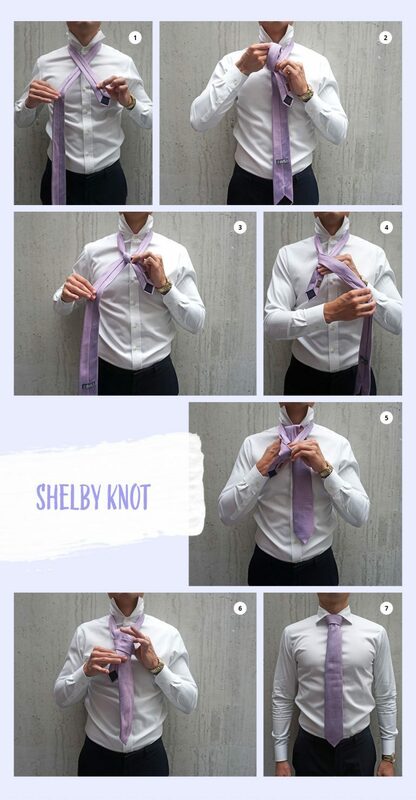 So, now you know how to put on a tie in four different tie knots! These are the most known ones (and the easiest, for that matter). 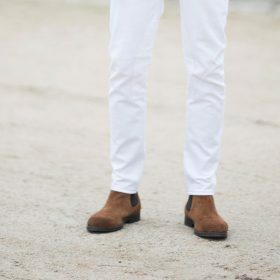 They’re great for day-to-day outfits as well as birthdays, parties and presentations. From now on you’re the tie king (or queen)! 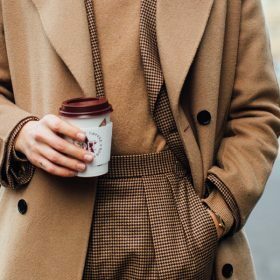 Show us your tying skills on Instagram @fashiola_!